Make sauce: In a 4- to 5-qt. pan over medium heat, sauté onion in oil until softened, 5 to 8 minutes. Stir in garlic, chile flakes, and fennel; cook until garlic softens, about 1 minute. Stir in remaining ingredients, bring to a boil, then reduce heat and simmer uncovered, stirring occasionally, until thick, 15 to 25 minutes. Meanwhile, make meatballs: In a large bowl, combine egg, milk, and panko and let sit a few minutes. When crumbs are softened, stir in grated pecorino, garlic, parsley, salt, and pepper. Add meats, breaking up with your fingers, and mix well with your hands. With wet hands, roll meat mixture into 16 balls, each about 1 1/2 in. wide. Heat oil in a large, heavy frying pan (preferably nonstick) over medium-high heat. Cook meatballs until well browned all over, turning as needed, 6 to 8 minutes total; reduce heat if needed. With a slotted spoon, transfer meatballs to paper towels. Gently stir meatballs into sauce, return to a simmer over medium-low heat, and cook uncovered, stirring occasionally, until sauce is very thick, 10 to 15 minutes. To serve, put a basil leaf in each roll. 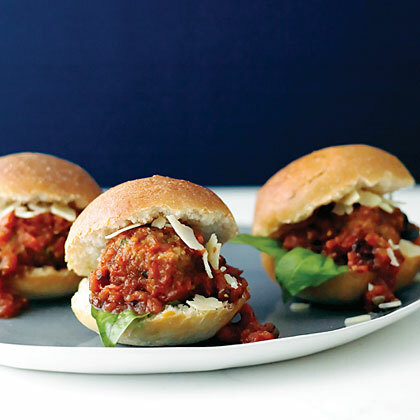 Set a meatball and a generous spoonful of sauce on each basil leaf, then add a little pecorino. Close sandwiches with toothpicks if you like. Serve with napkins. Mastering meatballs. They sound rustic, but they're delicate things that suffer from over-handling. Here are tips for making them come out right. Mixing: Always start by mixing the bread crumbs (which keep the meatballs from getting tough), any liquids, and seasonings—then add the meat. Stop when the mixture looks evenly blended; don't overwork it. Forming: Dampen your hands with cold water to keep the meat mixture from sticking while you roll it into balls. If it's still sticky, let it sit for a few minutes in the fridge. Browning: A good crust helps meatballs retain their shape—important if they're going to simmer in a thick sauce. If you plan to eat them on their own or add them to broth, though, a light pan-frying will do the trick. *Crush fennel seeds with a mortar and pestle, or buzz in a clean coffee grinder. Note: Nutritional analysis is per main-course serving.